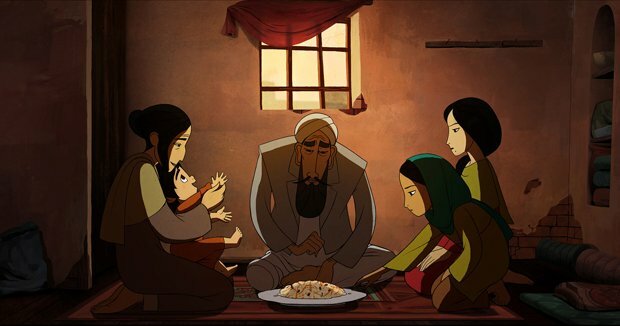 Nominated for the Best Animated Feature Academy Award at this year's ceremony, The Breadwinner is Irish filmmaker Nora Twomey's follow-up to The Secret of Kells (co-directed with Tomm Moore), which was itself nominated for an Oscar back in 2010. This adaptation of Deborah Ellis's book recounts in a frank yet accessible way what life is like, particularly for women and girls, in Taliban-controlled Afghanistan. Taking place in 2001, the story is seen through the eyes of a spirited 11-year-old girl named Parvana (voiced by Saara Chaudry), who lives in Kabul. She regularly accompanies her father Nurullah (Ali Badshah) to the market, listening to his stories about Afghan history, as he sells his wares to support their family. Events takes a dramatic turn when the Taliban arrest Nurullah for questioning their rules, leaving his wife and children in dire straits. Under the strict regime, females can only be seen in public accompanied by men, but the plucky Parvana disguises herself as a boy so she can move around the city unimpeded, earning money for her family by doing odd jobs. Moreover, she's desperate to find word about her father and where he has been taken. Parvana is a brave, naïve and appealing heroine for this story, a story that feels far removed from the Western experience. The hand-drawn animation has an elegant simplicity and the accompanying music feels as authentic as the historical detail that fills out the plot. Where the film slightly fumbles is in Anita Doron's script, which never quite sets out Parvana's path clearly, with frequent cuts to a folktale involving the Elephant King distracting. It's also hard to see how children will take to such a politically-charged narrative, one that feels more akin to adult animations Persepolis and Waltz with Bashir. Nonetheless, it's a valiant and vital effort. General release from Fri 25 May.